After she completed Fashion Design at the Utrecht School of Arts, Aniela worked for various fashion companies, gaining a wealth of experience in developing artworks and all-over patterns as well as in designing entire collections. Aniela launched Neffa in 2004, as a way to better express her creativeness and to give her the opportunity to turn her original ideas into surprising products and concepts. Aniela wants to change the way we use textiles and is investigating how we can and will use textiles in the future and what the implications are. Using technology and microbiology, she tries to improve or change the properties of textile. For her textile is an extension of the skin and she is interested in its multifunctional layers and how to apply those in textiles. She translates technology into surprising, tangible results in textile, with a distinct style and a unique appearance. Aniela helps companies, research institutes and universities by applying their technology into prototypes or designs in order to make it more appealing for a specific target group or a wider audience. She also initiates her own projects and gives inspiring presentations. Her work is featured in various magazines and blogs as WGSN, Icon and Coulture and is regularly exhibited. How did you get into fashion and wearable tech? How long did it take you to be where you are now? After I completed Fashion Design at the Utrecht School of Arts (1999), I worked for various fashion companies (i.a. Tommy Hilfiger, Gaastra) gaining a wealth of experience in developing artworks and all-over patterns as well as in designing entire collections. I launched Neffa in 2004, as a way to better express my creativeness and to give me the opportunity to turn my original ideas into surprising products and concepts. The name Neffa means “net effe anders” in Dutch, wanting to do things just that bit differently. I believe that distinctiveness and individuality in people and materials are the elements that make the world a special place The first product was the Letterbag, a personalised concept for an everyday object. It was a shoulder bag of which the consumer could choose the colour of the bag and of the ink (also glow-in-the-dark), but the model itself was the same for everyone. This way they would be part of a community, but also remained true to their own style. In 2008 I quit my day job to focus even more on innovation. I started incorporating plug-holes in a nicer way in houses. We need electricity for all our devices and yet we try to hide all the plug holes. I have redesigned the plug-holes and room itself to integrate them, to make the plug-hole part of the design. From there on it was just a small step to start working with electricity in textiles. And nowadays I work multidisciplinary in the field of textiles, technology and microbiology and am interested in developing dynamic textiles for personalisation. I have been working on projects with solar energy (Solar fiber, Solar in between, Dynamic skin) because I want to have independent energy sources that we can wear. But also smart inks are part of my work. With the Chameleon mood scarf I am researching how textiles can react to our environment and mood, just like the chameleon does. My work is always inspired by nature (biomimicry) and I like to develop concepts and applications that have the features as much as possible integrated into the textile. Using nature as an inspiration source also led to the fact that I work with nature itself. With MycoTEX I am growing my own textile and this material has the potential to be antimicrobial and skin caring by nature. And now I am slowly combining technology together with microbiology in textiles. Everyone has an opinion about what you do and want to box you. Designers would see me as an artist, artist as a designer. Am I a fashion, textile, wearable, material or maybe bio designer? To me I am neither of them. The biggest obstacle was to find my own way. I am what I do, what I make. What are the challenges of being a designer in the niche you are in (smart textiles)? “Everyone" believes in the potential of wearable technology. However a lot of the fashion companies still don’t want to invest in this. The same goes for technology companies. They don’t realise that you need to invest in good design to make it more interesting for the fashion industry to start working with it. What they have in common is that they will start investing (more/better) as soon as they find what the market is. However I think we don’t know the market yet, because there are hardly any things to try for consumers. How will we know if we’re not trying? It is the chicken and egg to me. But also all the technology needs to fit in the system of fashion production. I think for true innovation to succeed we need companies that work together from scratch. Design new supply chains with both technology production and textile production incorporated. To make this more understandable I have made a research book of Dynamic skin. In this book people can see the process of working simultaneously with fashion and technology. In this process fashion influences the technology and vice versa. How about being a female designer and entrepreneur? I don’t know if being female influences anything. It seems logic as we still make less money for the same jobs men do. But what I do know is that working in the creative industry makes people not want to pay for your services. Give presentations for free, if I am doing some kind of hobby. But you like what you do, right? Or making prototypes for the clicks on the internet. Why not pay me for the work that I am doing? But I don’t know how these people would react to men working in this industry. Would be interesting to find out. What are your biggest achievements to date? What are your projects you are currently working on? Disrupting the fashion industry by totally rethinking the whole supply chain of fashion. With MycoTEX I am changing the whole process of making garments; from producing the material to making custom-fit garments. I start by growing mycelium to be able to make a fully compostable textile. Then I shape this textile on a 3D mould, which in the future can be based on the body scan of the consumer. 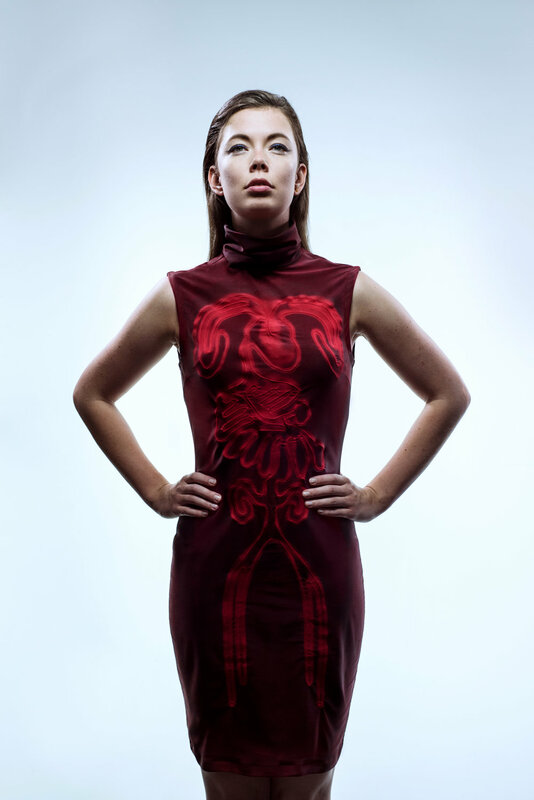 Being able to shape the textile directly onto a 3D mould also allows for new ways of designing garments. Currently we are - slowly - shifting from designing in 2D to 3D with programs like Lectra’s 3D virtual prototyping. With MycoTEX we will be able to design in 3D FOR 3D, which can give us different shapes. As long as the men in tech don’t change, nothing will change unfortunately. By the way, have you noticed how many females are working in fashion tech? The Fashion industry has been dictated by men for so many years. I hope Fashion Tech will be ruled by females! I don’t think anyone can see where it is heading for. It might not go so fast at all. After all David Hasselhoff wore a LED jacket in 1989 on the Berlin wall. How many jackets with lighting did you see in 2017? Fashion has not changed very much, it is a stubborn industry. Maybe we will skip the whole fashion tech and go directly to skin tech, who knows? What is the most important piece of advice you can give to all smart textiles designers out there? Stay true to yourself and your ideas and work hard to realise them. Nancy Tilbury, Suzanne Lee and Neri Oxman.